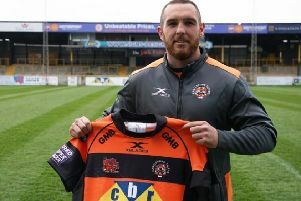 Castleford Tigers forward Lewis Peachey has been included in the Yorkshire Academy Origin squad for the first game of a three match series against Lancashire. Peachey was involved in the county Origin series last year and has kept his place in the team after impressing with the Tigers' Academy team. The 19-year old is yet to make his first team debut for Castleford, but after a good 2018 he was rewarded with a first team number for the Tigers and has been included in the team's 19-man squad on a number of occasions. The first game of the Origin series will take place at Castleford's Mend-A-Hose Jungle on Saturday, April 20 (kick-off 2pm), giving Tigers fans the opportunity to cheer on Peachey and the rest of the Yorkshire players. For the second game, the Yorkshire vs Lancashire Origin game will be the curtain raiser for the Betfred Championship Summer Bash on Saturday, May 18 (11am). The series will conclude at Odsal Stadium in Bradford on Saturday, June 15 (2pm). Several Aussie-beaters, a handful of players with senior Betfred Super League experience, and a couple of familiar Rugby League names are included in the Lancashire and Yorkshire squads that have been announced today for the three-match series. Umyla Hanley, the son of Ellery who plays his Academy rugby for Wigan, is named for the first time in the Lancashire squad – and is joined by Jarrod O’Connor, the son of the former Wigan and Great Britain prop Terry, who recently joined Leeds Rhinos from Widnes Vikings. They are joined by Jack Welsby of St Helens, who starred in England Academy’s 2-0 series win against the Australian Schoolboys in the winter – and has followed a number of other players from that squad into the Super League in recent weeks.